It all starts with energy. Your arms, the tree, the chair you are sitting on, your mind, your money... It’s all just energy manifesting in different forms that is fluid and changing. Our cells completely change every week and our molecules are in a constant state of flux and none of them are actually touching the other yet we perceive ourselves as solid. We are actually 1% matter and 99% energy and because optically we can't see, touch or “physically” touch energy we focus on the matter. The energy space is actually where all the magic happens. Energy cannot be created or destroyed but the good news is it can be changed, transformed and experienced as you desire. For example, scarcity and lack is another form of energy but it can also be transformed to abundance and prosperity. So everything is energy and therefore our levels of success and happiness is highly correlated to understanding and utilizing not only our physical but also our unique energetic gifts to realize our full potential as spiritual beings. 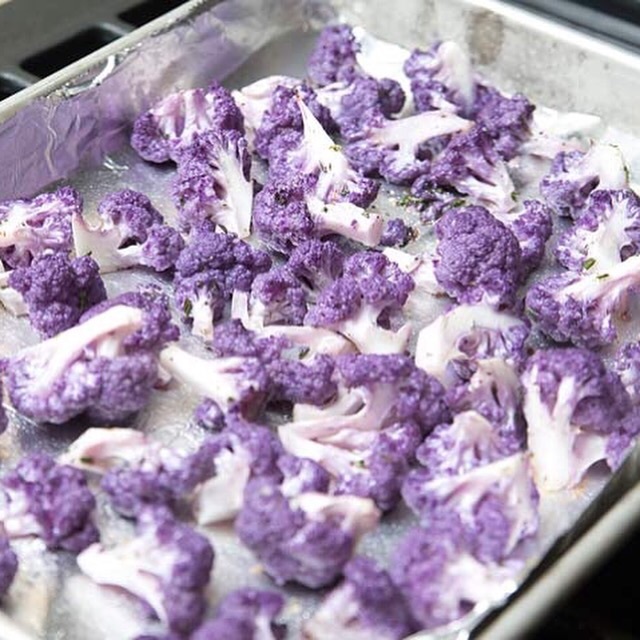 Roasting up these beautiful purple cauliflowers. They almost look too good to eat and much like their white variety they have immense cancer fighting properties but these purple gems actually can help raise your vibrations, intuition and connect you to your divinity. Each energy center has its own color frequency (red, orange, yellow, green, aquamarine, purple and violet). When we consume a food of a similar color or frequency, we feed that energy center. Hence eating the rainbow daily can help balance psychological and spiritual energy. As you feed your energy centers, you feed your soul. 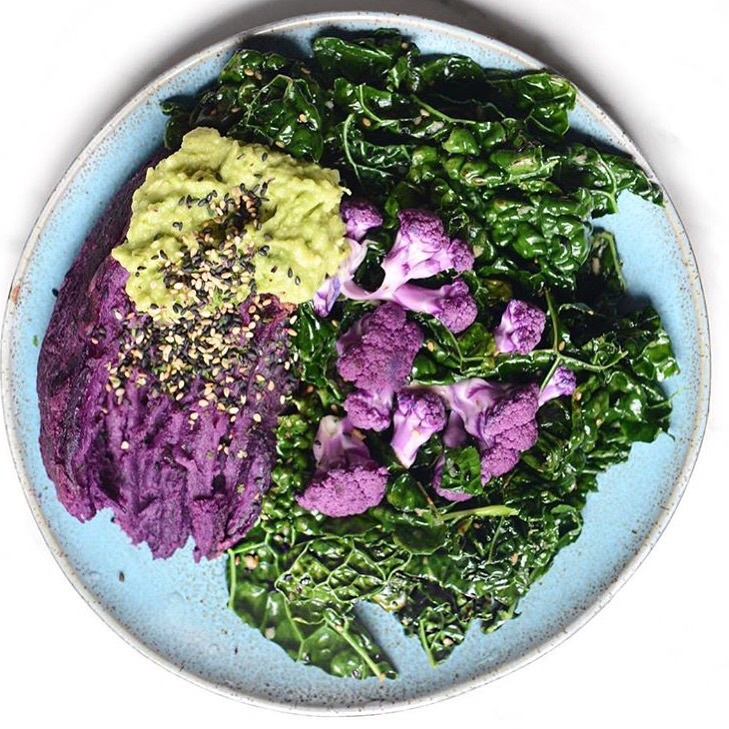 Eating bluish or purple foods in particular will help the third eye and crown centers to gain clarity and focus. Among other great choices are: blackberries, black currants, blueberries, red or purple grapes, prunes and raisins. In Kundalini Yoga the Stretch Pose must be the most dreaded pose but it is definitely one of the most powerful asanas to literally transform your life. The Stretch Pose realigns our navel center in under 2 minutes a day. When our navel center is weak, we tend let life happen to us, however, a strong navel center is the true source of our willpower where transformation and empowerment start. You can have a six pack and still not be balanced in your naval center. It is an energetic center that when misaligned by even a millimeter can keep your vital energy stuck from circulating and providing you with the fulfillment, freedom and strength to follow through on your dreams. Even though the pose may look easy, it is quiet challenging and requires daily practice to build up to two minutes a day. Proper form and breath is important to help you keep up. Lay on your back and extend your legs in front of you with arms resting at your sides. Straighten your neck, lift up your head, upper chest, arms and draw in your chin while gazing at your toes. Do your best to keep your lower back flat against the floor as you lift the legs 6 inches off the floor, toes pointed. Hold for 2 minutes while doing Breath of Fire (Even inhales and exhales and build to 2 to 3 cycles per second). Do not do Stretch Pose or Breath of Fire while pregnant. You can start with 30 seconds and build up to 2 minutes a day. Commit to 40 days of Stretch Pose and watch negative thinking, procrastination, self-doubt and resentment melt away. Your presence will command anything and anyone in the room and you will attract all that is needed for your highest good. I will be starting my 40 days today. Who else is in with me?